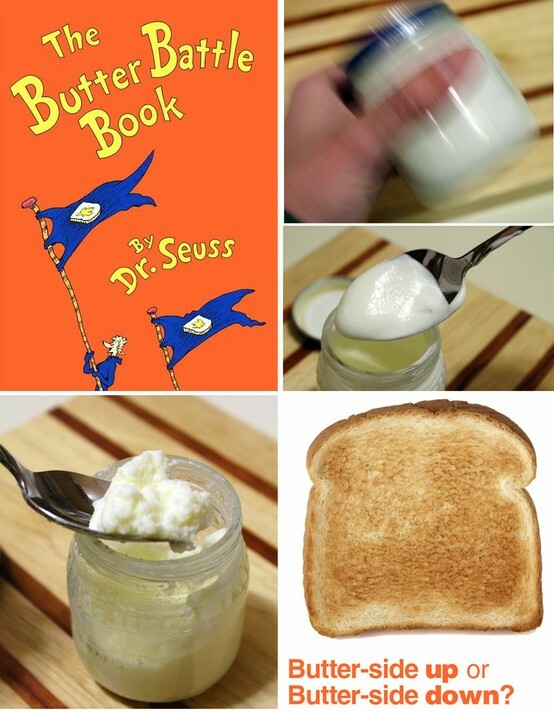 After reading The Butter Battle Book by Dr. Seuss, shake up your own butter with a bit of science! Kids will have fun watching a liquid change into a tasty solid! Pour 1/4 cup of heavy whipping cream in a clean jar. (Make sure the jar is no more than halfway full, so that the cream has plenty of room.) Then shake, shake, shake! Note: 1/4 cup of cream = about 1 Tbsp of butter. Chica and Joe: "As you shake, you’ll notice the cream go through several fascinating stages. Feel free to open the jar and take a peek whenever you notice a new texture." Check out their butter photos above! Click here to see the various stages that Chica and Joe encountered. I was trying to think of an activity for The Butter Battle Book when I read it to my children a few days ago. I am so glad I found your idea. If you are interested, stop by my blog, Happy Birthday Author. I would love for you to post a link to this activity on my Dr. Seuss Birthday Linky.